The DDS Community Edition is a full-featured open source, genuinely free implementation of the Object Management Group (OMG) Data Distribution Service for Real-Time Systems standard. Full-featured Apache license version 2.0 open source Data Distribution Service (DDS) implementation. The DDS Community Edition project exists to support the Open Source Data Distribution Service (DDS) developer and user community and to encourage their involvement to speed DDS innovation. For information on our Commercially Supported DDS implementation please see Vortex OpenSplice and the Vortex Software Downloads. The DDS Community Edition v6.9 software can be downloaded from here. 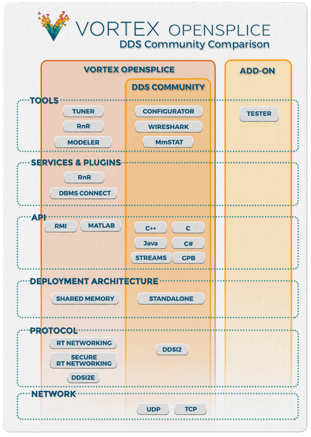 For the latest software downloads please see the Vortex OpenSplice DDS downloads. For details of additional platforms supported other than those below please Contact Us. These distributions also include the source code. After downloading one of the DDS Community Edition HDE distributions please see the installation instructions for how to install and configure your runtime environment. The Vortex OpenSplice DDS full HDE evaluation distributions contain an executable installer that should be run. Can't see your product or platform? Evaluation distributions for products or platforms not listed above can be made available on request. Please Contact Us with additional details of your development environment and/or target platform and we will do everything to help. For documentation and instructions on Building and Installing DDS Community Edition from a Source Bundle click here.